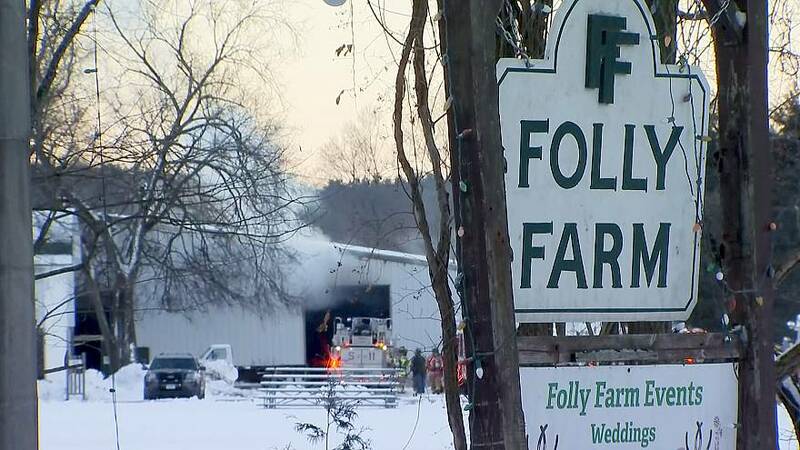 Two dozen horses died in a barn fire early Thursday at a farm in Connecticut, according to the owners of the farm. "There are no words to express our sorrow this morning," read a post on the Facebook page of Folly Farm in Simsbury. "The fire department is still investigating the possible cause of the fire in our arena barn however 24 of our beloved horses have passed away due to smoke inhalation." The horses that died were part of the farm's riding and polo schools and three were privately owned, said farm general manager Alison Patricelli in a follow-up statement. "These gentle souls taught hundreds of children and adults how to ride, to play polo, and to love through the years," said Patricelli. "They were the heart and soul of Folly Farm and of our lives." Nineteen horses housed in other barns were not injured in the fire, she said. "I was heartbroken there's no other words for it and I will continue to be for a while," Andrew Davis, who lost his horse Columbiana, told NBC Connecticut. Despite the tragedy, Davis said the care at Folly Farm was "amazing." Firefighters were called to the farm around 6:45 a.m. Thursday, Simsbury Volunteer Fire Company spokeswoman Kitty Vangunten told NBC News. Responding firefighters discovered heavy smoke and some structural damage at the site of the fire, she said. "There were 24 horses in the barn and all 24 died of smoke inhalation," she said, adding that no people or firefighters were injured by the fire. The fire marshal's office determined on Thursday afternoon that the cause of the fire was accidental, Vangunten said. While they were continuing to investigate the fire, they believe it started in the storage room in the center of the stall area, she added. Vangunten said Fire Marshall Kevin Kowalski told her: "We believe the fire was smoldering for hours." The 175-acre farm offers polo instruction, horse riding instruction, horse boarding and the Simsbury Polo Club. "The care here is amazing, I mean I worked here for two years so I knew it so when I was moving I knew that this was a great home and there's no denying that," said Davis. "This was just a tragedy that couldn't have been prepared for." A message left with the Simsbury Volunteer Fire Department was not immediately returned Thursday afternoon.